Define your ideal client, discover where they are, and how to market to them. Describe your unique offering to clients and what differentiates your firm in a crowded marketplace. Tell the story of your firm and each of your advisors, so ideal prospects understand why your firm is the best fit for their unique needs. Refresh your social media presence. 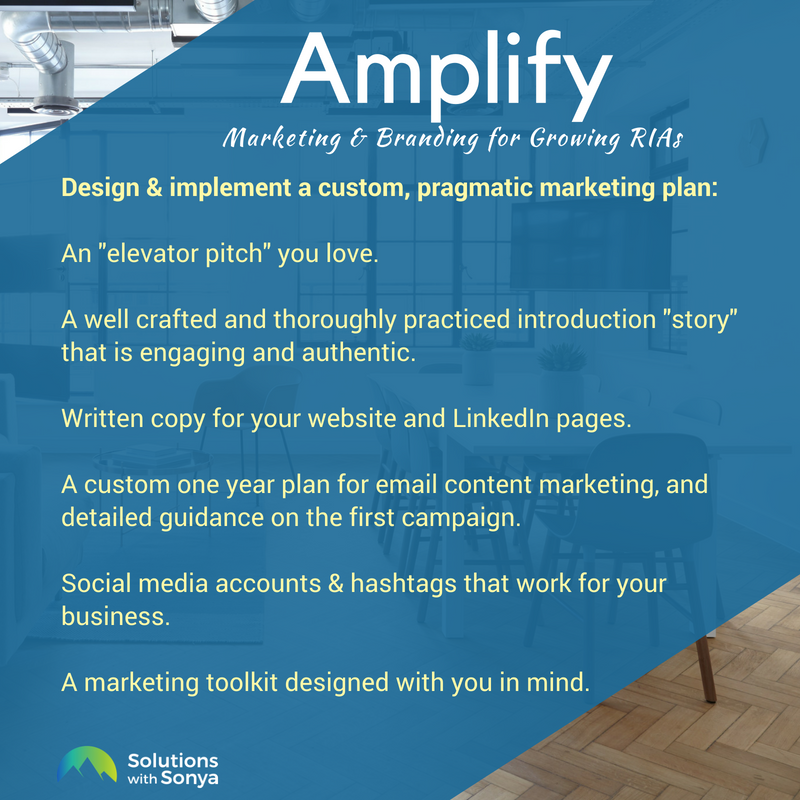 Create a step-by-step practical online marketing plan for regular engagement with your target audience. Find or create in-person marketing and awareness opportunities, and prepare you to engage your audience and effectively market your business. Define your market and your ideal client. Develop a compelling and memorable story about yourself and your firm. Identify your unique offering that differentiates you from other firms. Meet your ideal clients where they are and meaningfully position why your services meet thei uniwrque needs. Tell your story! To prospects and clients, on your website and social media, in interviews and podcasts, at speaking engagements and networking events. In depth assessment of current web presence and marketing materials. Site by site recommendations for improvement and increased client engagement for website, all social media, and marketing materials. Social media hand-holding (we'll edit your first few posts) and coaching. Social media image creation lesson. Email campaign hand-holding (we'll edit your first campaign) and coaching. You’ve identified your target market and have something unique to offer them. You’ve fine tuned your story. Now, go get out in front of that target market, tell them your story, what problems you solve, and why you’re the best firm for that type of client. Identifying referral sources and creating custom outreach plan for each. Brainstorm off-the-beaten path networking or event opportunities. Develop email content marketing plan and create a 12 month calendar. Identify ways to get helpful feedback on your business and marketing plan. Administrative and technical support available for clients who are committed to the marketing plan and want to outsource the technical aspects. Ongoing support and coaching for clients who benefit from collaborative brainstorming. Monthly or Quarterly refresh and ideas call with Sonya.